As Catherine Maire has shown, a "figurist" reading of Scripture, associated with the abbé Duguet, the abbé Étemare and other theologians at Saint-Magloire permeated Jansenist thought in the 1730s and suffused it with with millenarian expectation. Analogies and correspondances proliferated. Among the best known Biblical passages referring to the Last Days was Romans Chapter 11 which foretold the return to earth of the Prophet Elijah and the mass conversion of the Jews to Christianity. 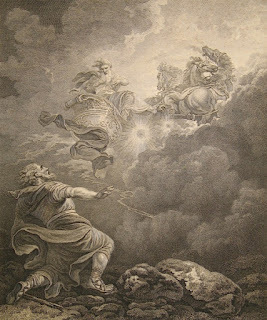 It was perhaps inevitable that someone would eventually claim that Elijah had returned or even, more extravagantly, that they themselves were Elijah. That person was the abbé Pierre Vaillant. 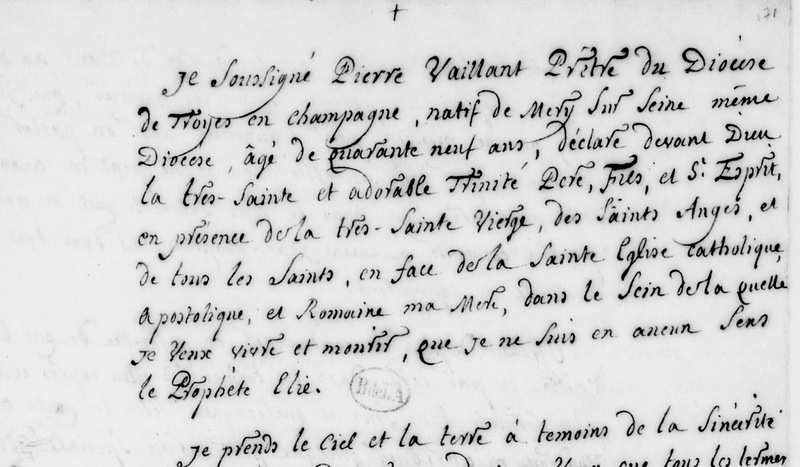 Almost all of what is known about the life of Pierre Vaillant comes from the Archives of the Bastille (Arsenal mss. 11032, 11033 and 11034); these contain papers seized at the time of his arrest in 1728 and notes taken in the course of various subsequent interrogations. 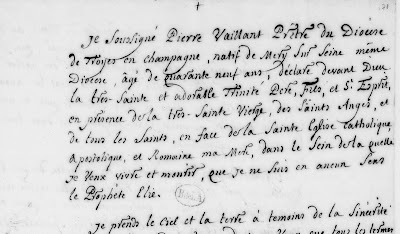 A note dated, probably inaccurately, to 1756 (ms 11032) has the following description: "Pierre Vaillant, preacher of the Diocese of Troyes, native of Mery-sur-Oise, at present 64 years of age, said to be the Prophet Elijah by certain convulsionnists who have formed a sect known as Eliziens or Vaillantistes". 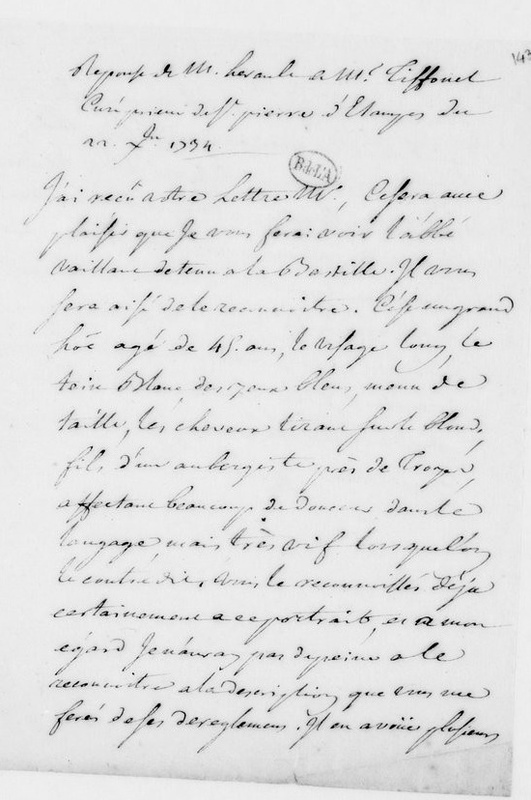 A note by the Lieutenant of Police Hérault dated 22 December 1734 describes him as "a tall man of forty-five, with a long neck, pale complexion, blue eyes, slim, with blondish hair, the son of an innkeeper from near Troyes”. Hérault adds that he “affects much gentleness in his speech, but is animated when contradicted” (Ravaisson, p.391). According to Montgeron, who knew him, Vaillant was an odd man given to erratic behaviour ("un homme singulier, et assez souvent d'une conduite inégale”). Although courageous and pious he was very imaginative and likely to fall prey to delusions. For instance, since his youth he had been given to extreme fasting, but he would occasionally sit down to a sumptuous repast which was well beyond his means. (La vérité des miracles, iii, p.615). Hérault's 1734 description of Vaillant, Arsenal ms 11032: "C'est un grand homme âgé de 45 ans, le cou long, le teint blanc, les yeux bleus, menu de taille, les cheveux tirant sur le blond, fils d'un aubergiste, près de Troyes, affectant beaucoup de douceur dans le langage, mais très vif lorsqu'on le contredit"
Montgeron now gives an account of Vaillant's notorious attempt to put Elijah's prophesied conversion of the Jews into practice. It would appear that he decided to put his powers to the test by approaching the Jewish community in Metz. He first went to Paris to raise monies to distribute, so that the poorer Jews at least would be more inclined to listen to his message. According to Montgeron, his piety earned him alms but he hid his true intentions from his benefactors. A certain frère Amable who was a young man with a gift for words, obtained his confidence and agreed to accompany him. They distributed their funds and were allowed to preach in the synagogue, but, as Montgeron confirms, the Jews of Metz merely laughed at them and they failed to win a single proselyte. The note of 1756 specifies that Vaillant went in March 1734 and was accompanied by "thirty ecclesiastics". Montgeron puts the date earlier - Vaillant and frère Amable had returned to Paris by the end of 1733, suitably mortified, but concealing their lack of success. Vaillant now began to practise extreme penitence and to preach with some success in Jansenist circles, announcing that Elijah would soon come, beginning his mission this time with the punishment of the Gentiles. Since what he taught conformed with doctrine the convulsionnaires, several of their number joined with him. In February 1734 he asked Montgeron to accommodate his group in the house he was building next to his own; Montgeron readily agreed. The two girls Martine and Manon accompanied Vaillant in the capacity of servants. It was on 5th May 1734 that Vaillant was arrested for the second time, coming out of Saint-Médard. At this point, according to Montgeron at least, there was no public hint of "Vaillantisme". It was only towards the end of June 1734, when Vaillant was already in prison, that Martine declared openly to the penitents with whom she lived that Vaillant was Elijah. Montgeron says that he himself had been present and been taken completely by surprise. Martine claimed that Elijah's soul had been reincarnated in Vaillant's mother's body, that his birth and career at Troyes had witnessed several miracles; and that now great marvels would proclaim his public mission. At the end of the year M. Vaillant would exit the Bastille flying in a chariot of fire and would receive great power to act against the Gentiles. Manon gave a similar account. The two young women were not convulsionists, confides Montgeron, but they had a way with words ((La vérité des miracles, iii, p.615). Among the notable adherents, besides frère Amable, was a young man called Baron, nephew of a procurateur of the Parlement. For a time the faithful gathered regularly to pray outside the Bastille in expectation of the miracle. By this time Vaillant had broken decisively with the more orthodox spokesmen of Jansenism, who were already deeply divided over the convulsionnaire phenomenon. His manuscripts included a letter from Mme Duguet-Mol, the theologian's niece, denouncing his activities. At the time of his second arrest the Nouvelles ecclésiastiques reported that several people who were "seduced and given to illusion" had spread about the word in the provinces that Elijah had come; and that Vaillant would miraculously break out of his gaol (6 October 1734, p.182) It also printed a letter of condemnation from Colbert of Montpellier. Even Montgeron, indefatigable supporter of the convulsionary movement, condemned Vaillant's delusion as the work of the Devil. In October 1736 the Vaillantistes assembled for the last time to pray in front of the Bastille. Vaillant himself seems to have entertained his fantasies for a while longer. The story goes that one day his chimney in the Bastille caught fire and he thought for a moment his miraculous deliverance had come; it was only when the excitement died down that he was forced to admit to Hérault that he was definitely not Elijah. In May 1738, then again in January 1739, Vaillant signed a formal retraction. A final protestation appeared in the Nouvelles ecclésiastiques in 1739 (p.67). ....declare before God, the Holy and Adorable Trinity, Son and Holy Spirit, in the presence of the Virgin etc. etc. ....that I am in no sense the Prophet Elijah." Hérault decided that Vaillant was too mentally unstable to be released and he was to live out the rest of his life in prison. The dossiers give an idea of his activities - he wrote Biblical commentaries, demanded a marble altar, preached to the officers of the Bastille in 1743. In May 1756 he requested an interrogation in which he declared that he was ill and in the October of that year he was transferred to the prison at Vincennes. He never renounced his millenarian expectations, but continued to set revised dates for the Second Coming, the last in 1747. He wrote sermons, homilies, and prayers for his followers to read. Memoirs and letters preserved in the archives record his simple requests (for linen, foodstuffs and tobacco, a caged bird) and his personal feelings, which alternated between suffering and pious hopefulness. He died in prison at Vincennes, of a stroke, on 20th February and was buried under the name of "comte d'Ipssum", that it anonymously (inventory, dated 20 February 1761). He had a brother, a canon from Beauvais, plus a married sister and nephew, who laid claim to his inheritance. Even though he had became increasingly isolated in later years, it is said that there were those, even the time of his death, who anticipated his imminent resurrection. 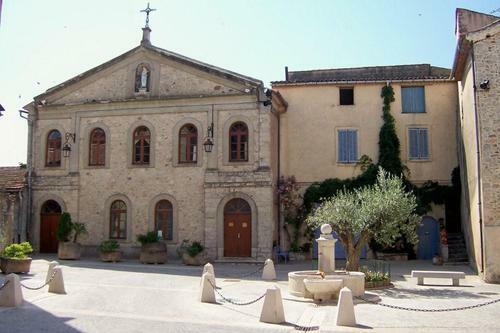 A final intriguing glimpse of the " Vaillantistes" comes from a journal article of 1907 which reports details of their stay in the village of Pignans in Vars, Provence, a beleaguered enclave of Jansenism in Monseigneur Belsunce's diocese of Marseille. They had been invited by a member of the local chapter called Boyer, who had previously been imprisoned in Vincennes for his Jansenist sympathies. They arrived by coach on the evening of 16th August 1736; many local people went out to meet them, and they were lodged in Boyer's home. Behind closed doors, religious meetings took place which were punctuated by strange cries. Members of the sect, in varying states of dishevelment, also emerged to accost passersby and threaten them with divine retribution; local Observantine nuns were terrorised when they burst into their convent to declaim again frequent communion and abuse of the sacrament of penitence. Eventually local sympathisers were rounded up and imprisoned, by which time, however, the Vaillantistes themselves were long gone. Further details emerged from the subsequent interrogations.Among the individuals named were several familiar from Montgeron's account, notably "Le sieur de l'Epine", aged twenty-five, known to the sect as frère Amable. Dressed theatrically from head to foot in red robes, frère Amable commentated on Scripture and prophesied in the course of supposedly supernatural convulsions. Another was called Legrand and another M. de Montfort. They also had with them a young boy of eight or ten called Benjamin who was given to silent convulsions. According to Boyer himself Le sieur de l'Epine aka frère Amable was in reality M. Colignon, a lawyer of the Royal Council and intendant of the Cardinal de Polignac, who had donated 30,000 livres to the cause of M.Vaillant and was married to Soeur Manon "one of the principal convulsionists of the sect". Le Grand he identified, more plausible as M.Baron, son of the procurateur and husband of Martine. Boyer attested that there were eight hundred adepts of the sect living in various parts of Paris; frère Amable possessed a house in which he personally boarded fifteen of them both men and women. They all regarded Vaillant as the prophet Elijah (hence the name Eliséens). They preached the imminent conversion of the Jews and the condemnation of the Gentiles, that is to say those Catholics who refused to recognise Vaillant as Elijah and persecuted his followers. The prophet himself was detained in the Bastille, where the concierge obeyed him in every respect. Vaillant had personally ordered his adherents to Provence in order to proselytise. They had previously approached the Jews of Metz, giving them large sums of money and garments made of cloth-of-gold in memory of the cloak of Elijah. Amable's insistence on his personal fortune was dubious and his conduct far from beyond reproach; having freebooted off the canon, he turned his proseletysing zeal towards his pretty niece and, when frustrated, made off with two of her frocks. It was said nonetheless that the irreproachable conduct of the group outside their convulsions won them local adherents and enabled them to recruit many pious women, who than accepted the most extravagant behaviour as inspired by God. Local magistrates, however, were sceptical that Vaillant had made many lasting followers. Louis Basile Carré de Montgeron, La vérité des miracles vol. 3 (1747), p.615-7. Gustave Arnaud d'Agnel, "Les convulsionnaires de Pignans", Annales du Midi 1907, 19(74) p. 206-220.